GYEON Q2 Primer 120 ml. Home > Shop By Brand > GYEON Car Care > GYEON Q2 Primer 120 ml. Primed for a perfect finish. GYEON Q2 Primer combines two product uses to form this easy-to-use paint finisher and primer. Providing superb pre-coating surface preparation and an incredibly gloss finish, GYEON Q2 Primer will perfect the finish on even the hardest paints and leave a smooth and slick surface, ready to be coated. Get your car’s surface PRIMED for perfection with GYEON Q2 Primer. GYEON Primer is the detailer's dream product - combining a last step product with a pre-coating paint prep! GYEON Q2 Primer has achieved in one product what many others provide in two. A fine finishing polish combined with a paint prep that doesn’t need to be removed before coating? Sign us up! Cut your detail time by 25% by skipping just that one step, yet still have a coating-prepared surface! GYEON Q2 Primer’s unique formula combines the finishing and prepping step into one for maximum efficiency. The low cut rating of 3/6 and extreme finishing rating of 6/6 makes GYEON Q2 Primer the perfect finishing/jewelling/high-glossing paint correction product. 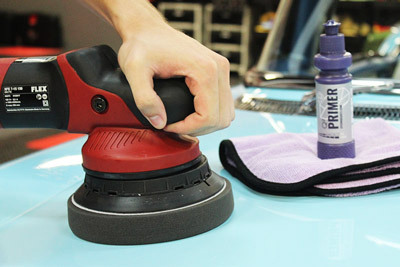 Use GYEON Q2 Primer with a waxing or jewelling pad on a dual action or rotary polisher. If you intend to apply a paint coating directly after using GYEON Q2 Primer, an IPA wipe down will be necessary. However, if you wait 24 hours after using GYEON Q2 Primer, no wipe down is necessary. GYEON Q2 Primer 1000 ml. GYEON Q2 Pure 30 ml.GYEON Q2 Pure 50 ml.GYEON Q2 One 30 ml.GYEON Q2 One 50 ml.GYEON Q2 SyncroGYEON Q2 Mohs Ceramic Paint Coating - 30 mlGYEON Q2 Mohs Ceramic Paint Coating - 50 mlGYEON Q2 Matte 50 mlGYEON Booster - 30 mlGYEON Q2 CanCoat - 200 mlGYEON Q2 Trim - 30 mlGYEON Q2 Rim - 30 mlGYEON Q2 View - 20 mlGYEON Q2M Compound+GYEON Q2M Compound+ 1000 ml.GYEON Q2M Compound 120 ml. GYEON Q2M Compound 1000 ml. GYEON Q2M Polish 120 ml.GYEON Q2M Polish 1000 ml.GYEON Q2 Primer 1000 ml.